In this article, we will learn about SQL SELECT statements and how to use them to retrieve data from our database. SQL SELECT statements are data manipulation statements which are used to retrieve the data from the database and manipulate it according to the use. All the statements in the SQL are case insensitive, so is the SELECT statement. SELECT statements are the most widely used statements and are often referred to as queries. It can give you all the rows from the database or a particular column or attribute value depending on the conditions that you have specified in the statement. SELECT Keyword is used to specify the name of columns that are to be displayed. FROM specifies the name of the table from where the data is to be retrieved. WHERE can be used to specify a condition on the basis of which data will be retrieved. 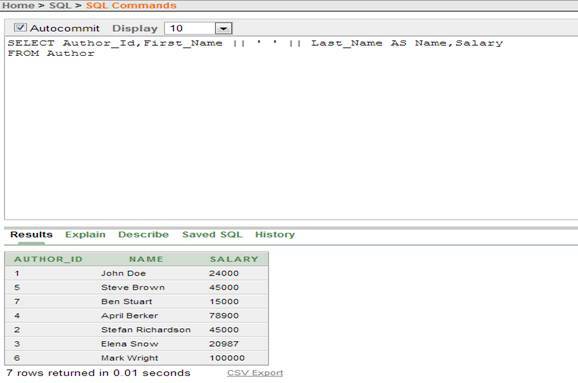 Step 1: In this step we will learn to select all the rows from a database using SELECT statement. 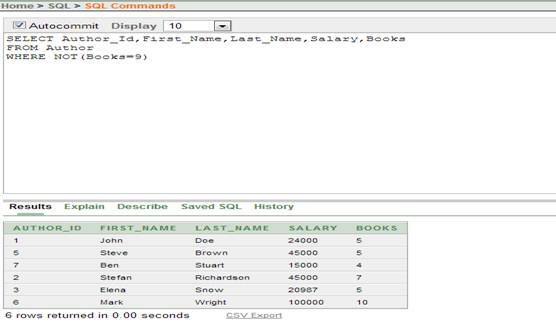 When we run the above query, then we will get all the rows and columns of the table ‘Author’. ‘*’ is a wild character which is used to specify that we want to select all the data. 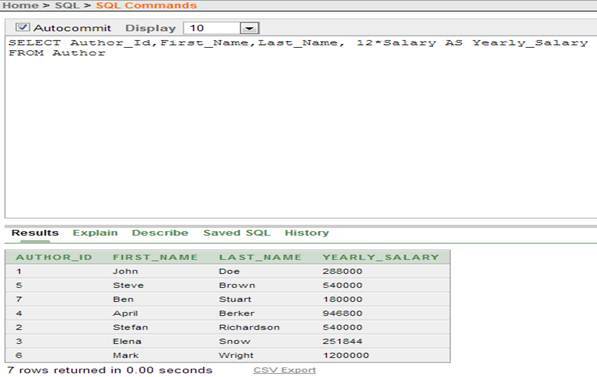 Step 2: In this step we will learn to select specific columns from a table. 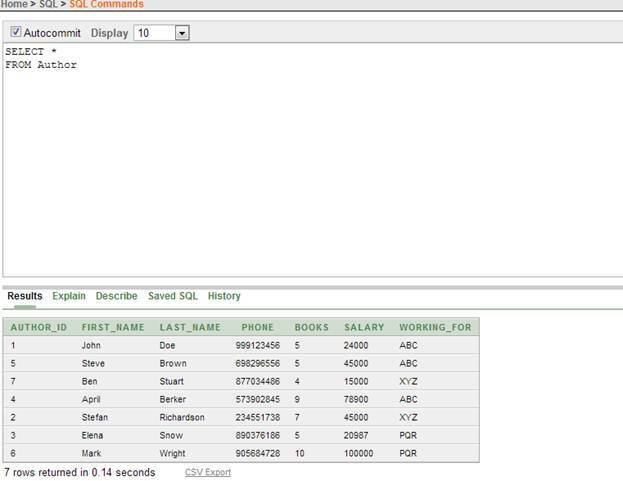 When we run the above query, then we will get only Author_Id, First_Name and Last_Name columns. We have to specify explicitly the name of each column that we want to retrieve after the SELECT keyword. Step 3: In this step we will learn to select specific rows from a table. When we run the above query, then we will get rows in which value of attribute ‘Working_For’ is ‘ABC’ . We have to specify the condition on the basis of which rows will be selected. Step 4: In this step we will learn to select distinct rows from a table. When we run the above query, then we will get rows only having distinct values of the attribute ‘Working_For’ . We have used the keyword ‘DISTINCT’ together with the column name to get all the distinct rows. Step 5: In this step we will learn to use operators to create expressions in Select statement. 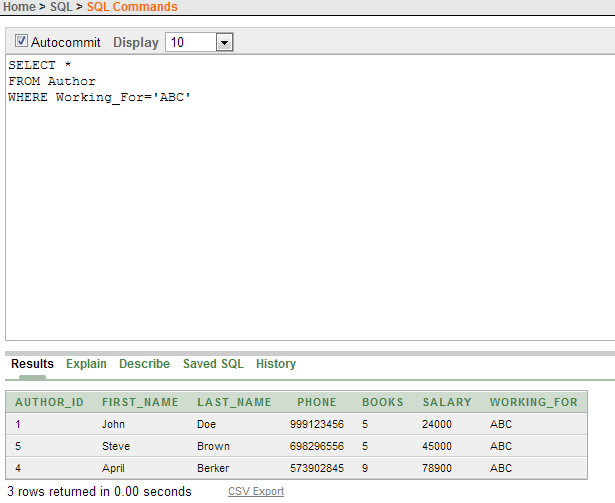 Listing 5: SQL query to create expressions in statement. When we run the above query, then we will get columns named as ‘Author_Id’,’First_Name’, ‘Last_Name’, ‘Salary’ and an extra column named ‘12*Salary’ and having the value of expression:12*Salary. 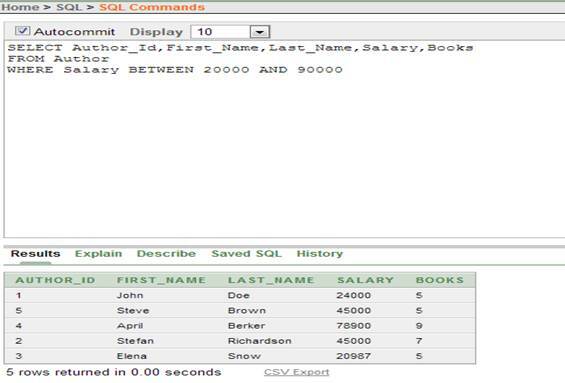 Step 6: In this step we will learn to rename a column heading in the output of query. 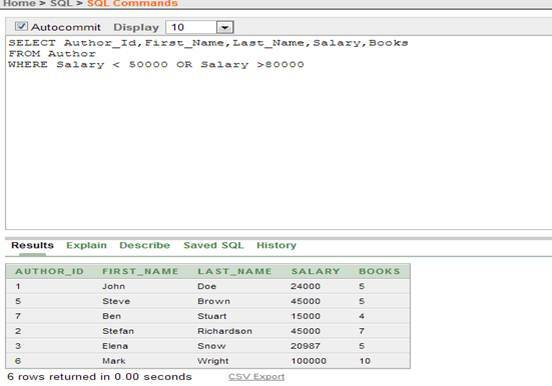 Listing 6: SQL query to rename a column heading. When we run the above query, then we will get columns named as ‘Author_Id’,’First_Name’, ‘Last_Name’ and an extra column named ‘Yearly_Salary’ and having the value as 12*Salary. We have used the keyword ‘AS’ to rename the column. Step 7: In this step we will learn to use concatenation operators to concatenate strings or columns. 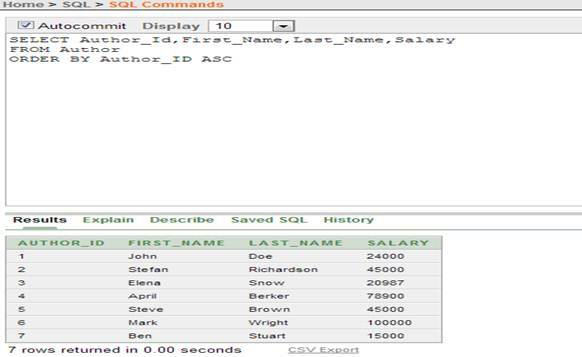 Listing 7: SQL query to concatenate column names and strings. When we run the above query, then we will get a column named ‘Name’ which will be formed by joining ‘First_Name’ and space and ‘Last_Name’. We have used the concatenation operator ‘||’ to concatenate the column names and to insert a blank between them. When we run the above query, then we will get information ,with columns named ‘Author_Id’, ‘First_Name’, ‘Last_Name’, ‘Salary’ and ‘Books’, of only those authors who have salary between 20000 and 90000. We have used two keywords ‘BETWEEN’ and ‘AND’ to separate the rows on the basis of salary. Step 9: In this step we will learn to use logical operators in SELECT statement. Listing 9: SQL query to use Logical (NOT) operator. When we run the above query, then we will get information ,with columns named ‘Author_Id’, ‘First_Name’, ‘Last_Name’, ‘Salary’ and ‘Books’, of only those authors who have not published 9 books. We have used ‘NOT’ logical operator which returns true when the condition is false. AND: It returns true when all the conditions are true. OR: It returns true when any of the condition is true. Listing 10: SQL query to use Logical(OR) operator. When we run the above query, then we will get information ,with columns named ‘Author_Id’, ‘First_Name’, ‘Last_Name’, ‘Salary’ and ‘Books’, of only those authors whose salary is either less than 50000 or greater than 80000. 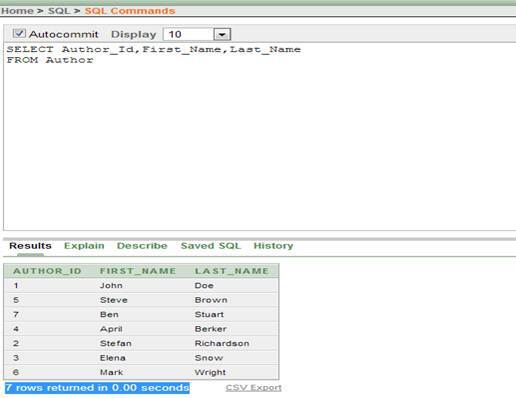 Step 10: In this step we will learn to order the result of SELECT query according to an attribute value. 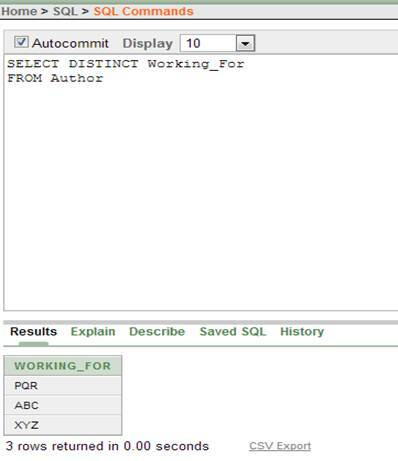 Listing 11: SQL query to order the SELECT statement result. When we run the above query, then we will get the tuples of the database ordered in ascending order of primary key. We have used the keyword ‘ASC’ to specify ascending order and we can also use ‘DESC’ to specify the descending order. 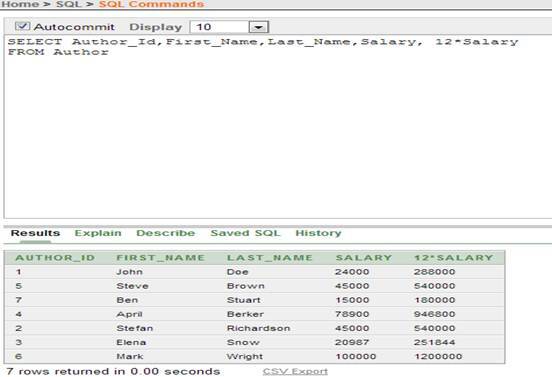 In this article, we have learnt about the SQL SELECT statements. We have learned how we can use them in various forms and together with arithmetic, logical, comparison and concatenation operators to obtain the required result.